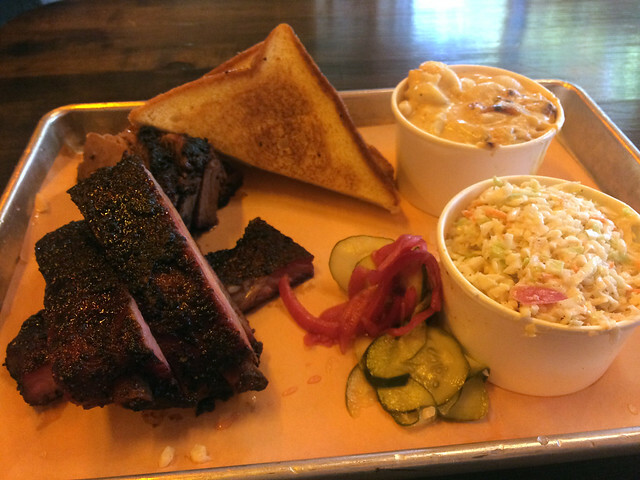 I’ve been making my way slowly through DC’s barbecue scene (slow because I always end up in a meat coma). When I was in Kansas City recently, I discovered that long lines = awesome barbecue. If no one was in line, then maybe you went to the wrong place. So intrigued by this long line theory (I won’t apply this to everything in DC…) and the fact that I had walked by the restaurant three times before I decided the line was sufficiently short, I queued up and ordered the Two Step. A heap of brisket, three pork spare ribs, two sides, Texas toast and pickles/ginger to add some color. The ribs were excellent, I should have ordered more! The brisket was good, as was the smoked cheddar mac and cheese, which achieved the perfect gooey ratio. I didn’t care for the slaw of the day, a little too acerbic for me. Go early, queue and eat at Federalist Pig! I’d recommend the Sampler Platter (three meats), but just how much can you actually eat?